Do you think about how to efficiently secure food and prolong its expiration date? Are you worried about how to store food so that it does not lose its taste and nutritional value? You do not like to waste food and in the kitchen, you value economic solutions? 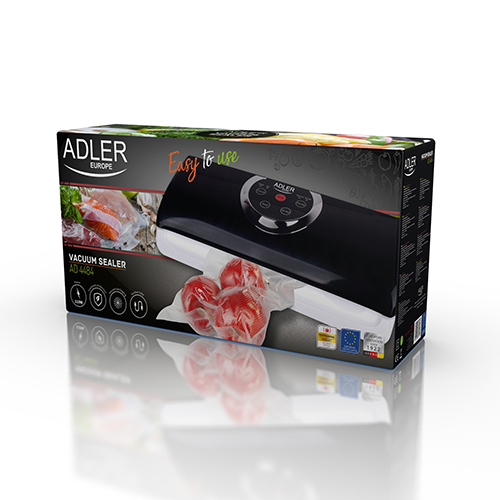 If so, the vacuum sealer ADLER AD 4484 is the product for you! 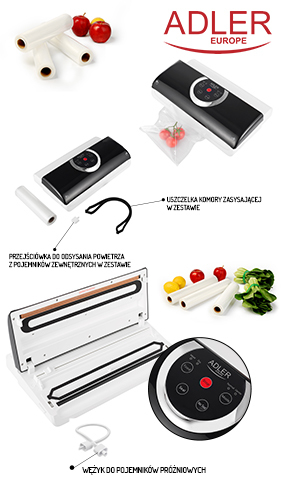 A vacuum packaging machine with a film welder in one device is an interesting solution. 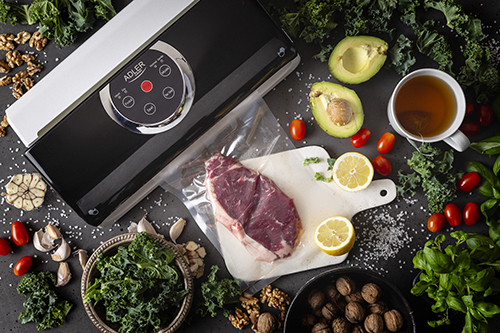 You can quickly pack cold meat and cheeses, dinner remnants, fruit or vegetables for freezing, and prepare dishes using the sous-vide method. High-quality finish and multi-functionality of the device make it work both in a single-person household and in a large family! welt the edges of foil sleeves on both sides to close it hermetically. 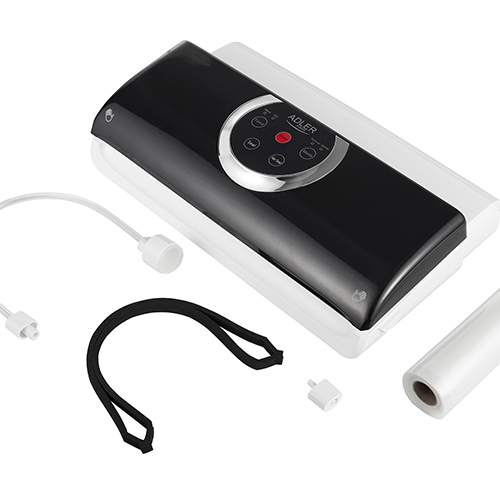 The device is equipped with a foil sleeves storage container and an adapter enabling the suction of air from external containers for vacuum packaging. You can choose whether you use all the functions or f.e. weld the bag tightly without sucking air from it only The welding line has a maximum length of 32 cm. Everyone who likes to cook knows that storing food is an important part of our activities in the kitchen if we want to eat healthy and nutritious dishes. Regardless of whether we are talking about a pre-cooked dinner, preparation of products for freezing, or cooking with using slightly more advanced methods, the packaging we use for that is very important. Inadequately stored food loses valuable nutritional values, vitamins and minerals and can sometimes be harmful to us. 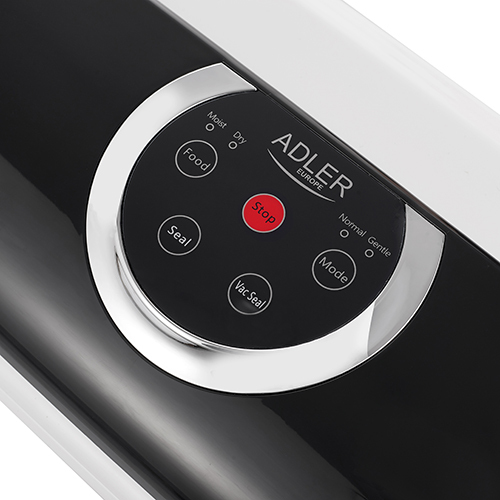 Therefore, the vacuum sealer ADLER AD 4484 should be in your kitchen regardless of whether you are a professional or a home cook. 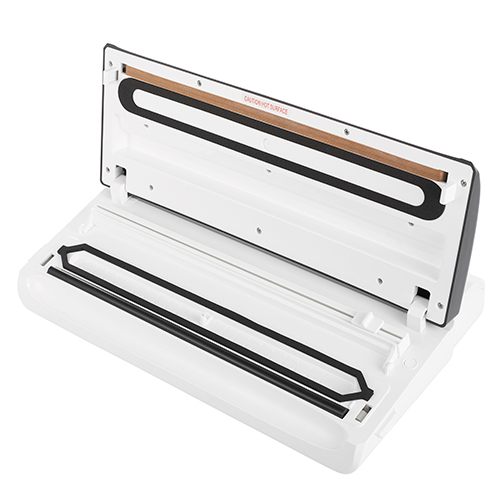 The biggest advantage of our device is that it combines two functions: a wrapping machine and a foil welder. This means that you can decide how you want to store or pack food. 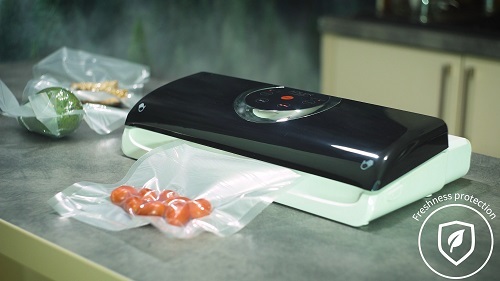 Hermetic packaging with air suction allows for longer storage of products in the fridge or freezer. 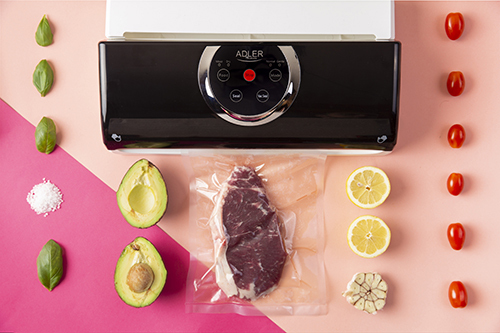 Welder adapted to plastic sleeves and ready-made vacuum bags will allow you to prepare meat for roasting or transport sandwiches from home to work. Quick suction and sealing of packaging will eliminate the need to buy paper, bags or plastic containers that are usually useful for preparing breakfast for children to school! The 130W packer quickly removes air from bags and vacuum containers, helps to weld the upper edge of the vacuum bag or foil sleeves (it will pack everything hermetically), but also cuts the edges of the foil sleeves. Thanks to this, you can adjust the size of the packaging to the size of the packaged food! In the set, apart from the device itself, you will also receive a container for storing the foil sleeve and an adapter for extracting air from containers and external packaging. Thanks to this, our product is also useful for packing not only food but also clothing or mailing products, trinkets and equipment that we want to protect from dust!